After loving the look of my Oh My Shirt, I wanted to make the dress version for July 4th. I found some blue striped fabric on sale at Joann's and went to it! I envisioned doing the waist tie in red. Unfortunately, this slinky fabric is 100% awful polyester and not only unraveled... but bunched when I sewed it together. 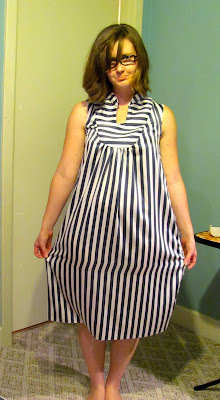 I also thought it would be cute to do the stripes horizontal for the yoke. 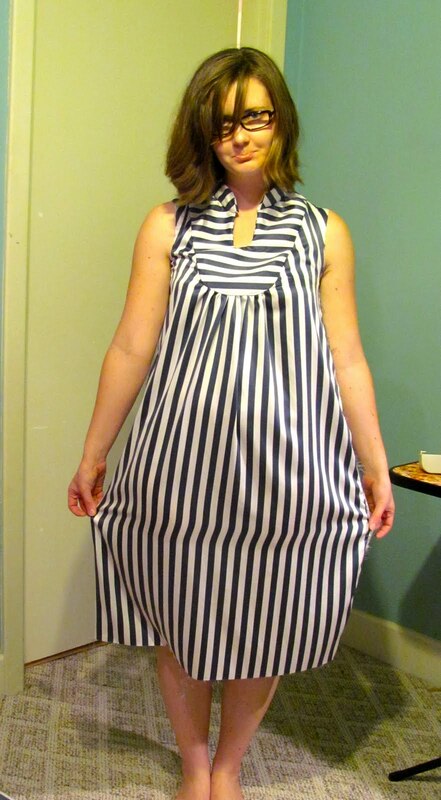 RESULT: It looks like a poorly made convict-print night gown. Luckily I was able to whip out a new July 4th dress in striped jersey in time for the fireworks. No pictures yet... maybe this afternoon!